At The Table... With Doris Italian Market: Onion Rings! Yay! Heat oil to 350 degrees. In bowl, stir 1 cup flour with salt, pepper, and paprika. 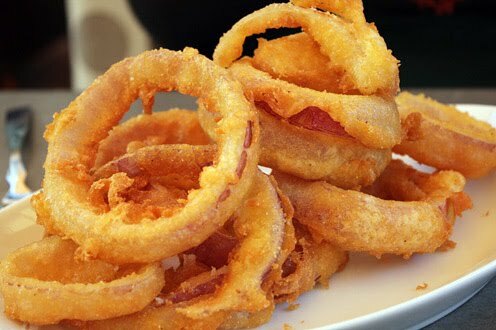 Drain onion rings and toss with flour mixture. Shake to remove excess flour. Mix 1 beer with 1 cup flour. Dip onion rings into batter and then place into oil one by one. Don't crowd rings in Dutch oven or they will stick together. Fry until golden brown. Remove and drain on paper towels. Keep warm on cooling rack placed in low oven. Note: If batter is too much, drain onion rings and dredge them in well seasoned flour, shake off excess and fry dredged onion rings in oil. This gives the onions a nice, crispy coating without the batter coating.